Medics Choice Eye Drops - 49566 Compares to Murine® or Visine® These Medic’s Choice .5oz Eye Drops provide rapid soothing relief to irritated eyes, ideal for use in a first aid room or on a job site as a single dose unit. They can be used to help remove non-toxic floating foreign matter from eyes as well as relieve eye irritation from pollen and dust particles. 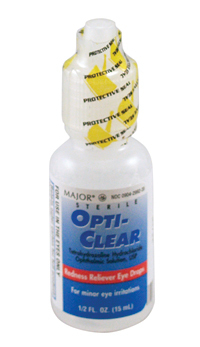 Medic’s Choice Eye Drops contain Tetrahyrozoline.